Quite a contrast for our first day. Breakfast in the Ace Cafe, an iconic biker caff from the '50s, was all bacon, beans and a slice. It set us up for the ride out of London. 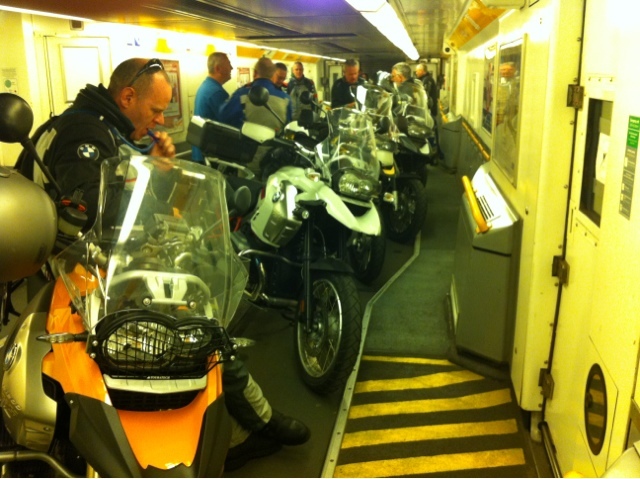 The Met's finest escorted us to the M25 and then we were off to Folkestone and the train. A cancelation put us behind plan so the group stuck to the Autoroute to Reims (That's pronounced Rhems not Reems according to Patrick). A few of us didn't know about the change of plan and had a wonderful, if longer, ride through NE France. Open roads, good Tarmac and sweeping bends. What's not to like? Late arrival meant the pre-prandial beer was rushed but we made it to Brasserie Flo for a lovely dinner and a glass of the local fizz.